Such a disappointing day weather wise. I’m hiking through an area that I know has some of the best best coastal views in the country, looking down across the many secluded bays on both sides of the ridge line, yet I can not see a thing due to cloud. Damn it. It rained quite heavy overnight but had eased off by morning. I woke at my usual time of 6am but hearing rain rolled over and slept in until around 7:30am. Packing wet gear is never much fun but I have a bit of system for it now, making sure that everything especially sleeping bag, clothes and electronics are individually packed in dry bags. Everything is laid out in the tent for easy access; secured & neatly packed inside the main pack dry bag; pack cover put on; pack out the door; leaving the tent to be pulled down and secured on the outside last. When the tent is wet, having it on the outside makes it much easier to just grab off and lay out to dry if the sun pokes its head out and keeps everything else from getting wet. The trail climbed high today onto major ridge lines following the spine of one of the many sections of land rising out of the ocean to form the Sounds. I know there are views to be had but not for me today. Without the views the walking was sort of boring. It passed through a mix of vegetation types including scrub/heathy stuff down low and beach trees up high with an understory of ferns, flax and other plants, leaves shimmering as they reflected sunlight off their wet surfaces, plus some areas of pine. Lots of people were out and about on the trail today. Given the lack of views I made a bit of a game it. Chasing down the slack packers (day walkers without packs) and racing past them with my big pack and poles, to the hushed whispers as I got past and moved on, “he’s moving quick and with such a big pack!”. A few mountain bike riders were also about. All were really good giving plenty of warning as they approached walkers from behind and flying down the hills. If I was to do the QCT again, in future I would definitely do it on a mountain bike. The walking is far too easy if not a little boring, other than the views, that I didn’t have today. Think I’d rather race down on two wheels and than slowly wander on two feet. Tonight I’m at Cowshed Bay camping area. I’ll be sleeping in my tent and it is raining now. We are expecting a bucket load tonight with 25mm predicted and more rain tomorrow. Not to worry. I have a cook shelter to huddle under and catch up with other people. 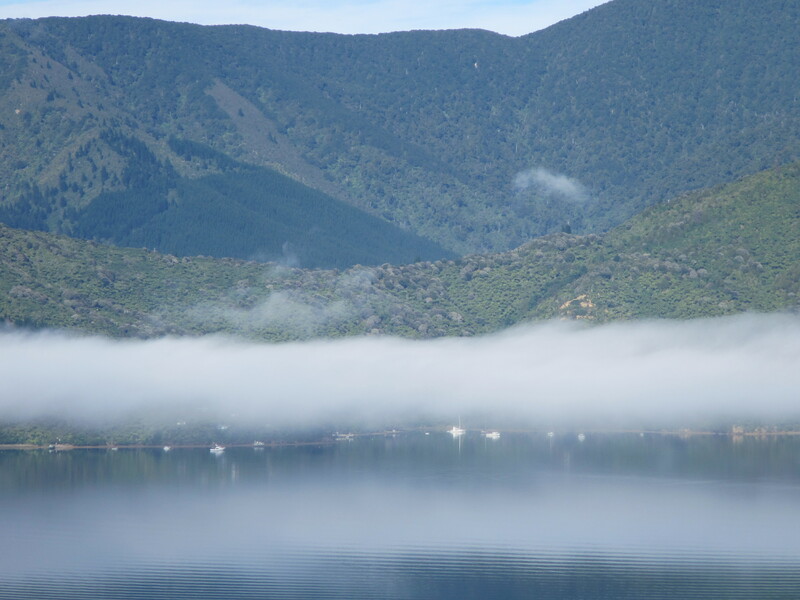 I have internet connection that lets me update this blog (without photos) and book a bed for tomorrow night after finishing the Queen Charlotte Track. 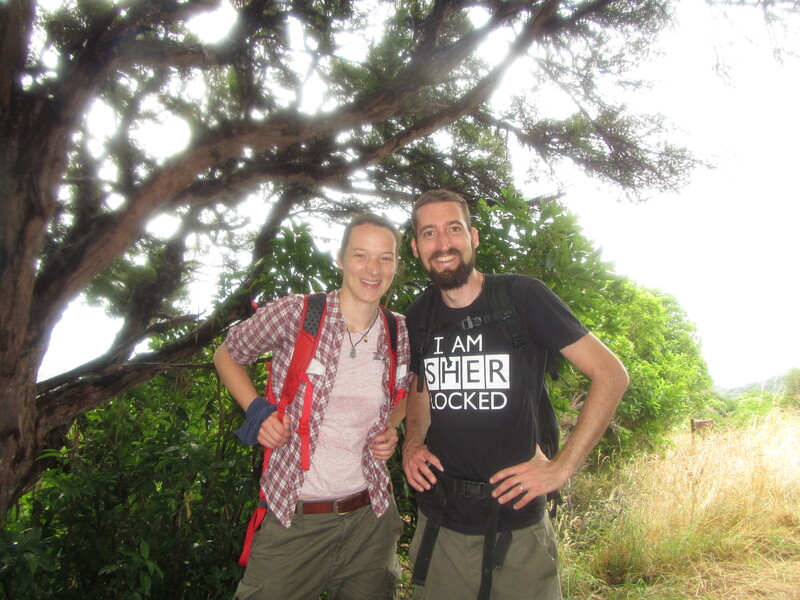 Silva & Martin, the Swiss couple, had slack packed today but on arrival at camp their packs were no where to be seen. How disappointing. The shuttle company was meant to deliver them to the campsite but hadn’t. They had to catch a ride into a lodge with a German couple car camping but also staying at the same camp to track down their packs. Luckily, they found them and more lucky for me they returned to camp with hot chips which they encouraged me to tuck into. Perfect on a wet afternoon. I only need to be asked once. My contribution was offering up tomato sauce packets. But how awesome are these guys? It’s Mario’s birthday today so they also returned to camp with a bottle of wine and some cake for him. Swiss people are the most amazing, friendly people in the world! The awesome, friendly Swiss couple, Silva & Martin. I have to agree about the Swiss. Lovely people. day 69 hee hee hee!